Phase one of the construction of the Lirangwe-Chingale-Machinga Road is progressing at a snail’s pace with 11 percent of the works completed, casting doubt on whether the contractor will meet the September 2019 deadline. During a site tour of the road by Minister of Transport and Public Works Jappie Mhango and Roads Authority (RA) officials on Saturday, it was noted that with seven months to go, the project, which started in April 2018, is still at foundation stage with about 3.5 kilometres (km) of the 19.8 km stretch of the road from Lirangwe to Chipini Trading Centre cleared. To date, 52 percent of the project’s timeline has elapsed. Project contractor Mota-Engil Malawi has attributed the delay to heavy rains. RA chief executive officer (CEO) Engineer Emmanuel Matapa acknowledged that heavy rains and issues of compensation might have delayed the project at some point, leading to changes in road design to minimise compensation costs. But the RA top executive also blamed the contractor for allegedly relaxing as evidenced by their failure to mobilise enough machinery to the project site. On his part, Mhango said he was optimistic that the contractor would work on the shortfalls and finish the project within the agreed time-frame . If a contractor fails to adhere to the stipulated time-frame, he/she risks paying liquidated damages to the Malawi Government and reduces opportunities for consideration in future works, among others, according to Matapa. Mota-Engil Malawi managing director Nuno Antunes was upbeat that they will beat the deadline. He said the contractor will beef up machinery once the rains are over. “We have done almost half of preparatory works, drainage and clearing bushes. Now we are waiting for the rains to stop and we will engage more personnel and heavy machinery to expedite the works and complete within the specified time-frame,” he said. The 62 km road will connect the M1 at Lirangwe in Blantyre District and the M3 a few kilometres from Machinga Boma. 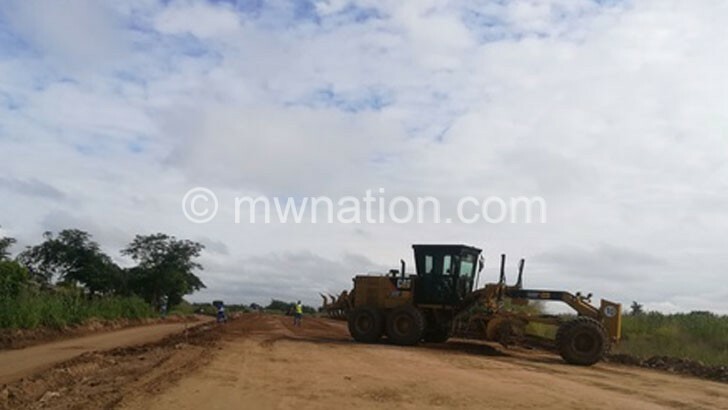 The K5.3 billion road project is funded by the Malawi Government and has been the centre of controversy owing to its delayed implementation over the years. Until April last year, the road project, which was set to start during the administration of former president the late Bingu wa Mutharika, did not take off despite being allocated funds in the national budget and from donors. In 2014, then president Joyce Banda laid a foundation stone to mark the beginning of the project, but, again, the project did not take off the ground. In May last year, President Peter Mutharika laid another foundation stone on the project.